Encompassing five short movements, Craig Armstrong’s Northern Sound… Islands (2002) takes the Scottish landscapes so loved by the composer and allows them to act as a symbolic starting point. The piece, commissioned by the Royal Scottish National Orchestra, allowed Armstrong to refer back to the expanses of light and saturated colour of American painter Mark Rothko, as well as to Ravel and Debussy, who described an impression of space with their music. Armstrong also used echoes of his electronic influences, recreating the looping and filtering techniques in an acoustic setting. 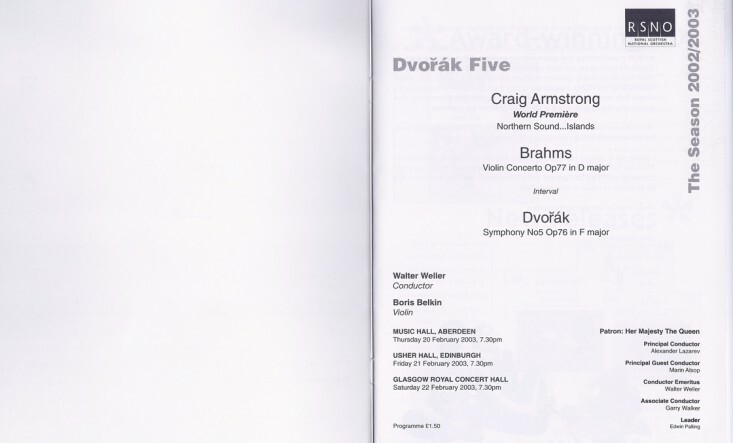 Northern Sound… Islands was premiered by the RSNO in 2003, at Glasgow’s Royal Concert Hall.